I must note that this post has very little if nothing at all to do with Michigan football, college football, football in-general, or even sports. 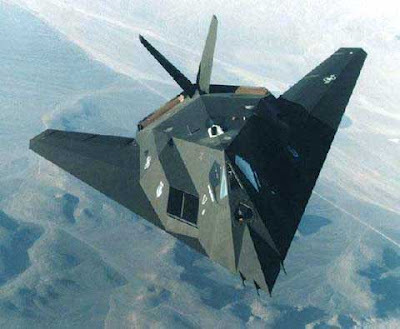 First of all, the US Air Force is retiring the F-117 Stealth Fighter next month. Story. I'm not really broken up or anything about it, just thought it was interesting. Apparently it will be replaced with the new F-22 Raptor. April 21 will be the last flight for the remaining radar-deflecting birds. They served the Air Force for 27 years. Only 59 were ever made, 37 of which have already been retired, and 7 have crashed. As an armchair air warfare buff, I liked this plane. One time I was at an air show with a good friend of mine, and we were standing about 20 feet from one of these jets behind a rope line. Armed airmen were standing guard along the rope line, and also answering questions from the crowd. My friend, who had a knack for asking stupid questions called the airman over. "Can I touch it?" he asked. "What if I hop over the rope and run towards it?" "I suggest you don't do that"
"What if I threw a hammer at it?" The airman laughed, and then said with all seriousness..."You'd hit the ground before the hammer hit the plane." 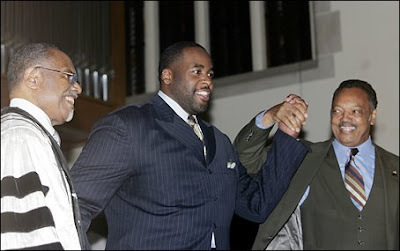 Also, on a brighter note...the mayor of Detroit gave his annual address to the city last night. The "State of the City" speech was particularly intriguing this year because the mayor, turns out, had a tough time keeping his secret affair with a city employee a secret. 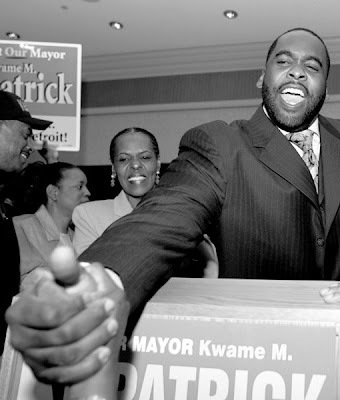 Text messages sent from him to her have surfaced, causing all kinds of trouble for Kwame and the city. And now, since lawyers and prosecutors have been combing through text message records, they have found out that the mayor has been awarding lucrative city contracts to his buddies for money and perks. Its city government at its best. Go Detroit! I watched about 5 minutes of the speech before I couldn't take it anymore. I just thought it was funny to see the mayor class it up a little bit. Whenever he messes up and people get mad at him, he takes his earrings out, he dresses less like a thug, his posse of 300-pound linebackers don't follow him around, and he gives speeches in front of churches using a lot more quotes from the Bible. Amazing. Detroiters fall for it every time. 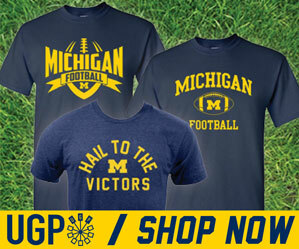 And for all of you keeping count, this is the 100th post of the Maize & Blue Nation. Fitting that is has nothing to do with sports. Ehh...whatcha gonna do? Kwame is an idiot. Detroit is going down, down, down until they get someone who, ya know, knows something about how to run a city in there.